For more than 60 years, PEINER SMAG Lifting Technologies GmbH — PSLT for short — with its product, PEINER grabs, has been renowned for quality and customer satisfaction in the field of bulk goods handling. The wide range of products allows PSLT to provide the right answer to every customer request in the field of coal handling. Owing to its many decades of expertise in development and construction of grabs, PSLT’s customers have put their trust in the company and relied on PEINER grabs — particularly in the difficult market situation of recent years. To further develop this expertise, the company makes above-average investments in the research and development of products. Thus new designs and alternative materials are continuously brought into serial production. At PSLT, the customer is always the centre of attention. The size, shape and dead weight of grabs may vary and, therefore, be tailored in every respect to the needs of customers. PEINER grabs are adapted both for lifting devices and for each application to always find an optimal solution. 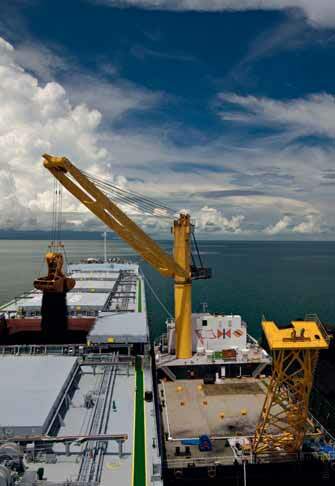 PSLT offers a wide range of grabs suitable for coal handling. PEINER Four-Rope Dual Scoop Grabs (VSG) achieve maximum efficiency through the optimum balance between dead weight and crane capacity and also require low maintenance. Ideal for loading and unloading coal of ships are PEINER Scissor Grabs (SCG). Based on the scissor principle and the double reeving of the closing ropes, the SCG is the fastest and most efficient grab for coal handling. It goes without saying that electro-hydraulic grabs from PSLT are a good choice when it comes to coal handling as well. This year PSLT manufactured various grabs for coal handling projects in Asia, Europe and South America. A well-proven alternative to motor grabs, especially for countries with weak infrastructure, is the PEINER radio- controlled single rope grab. It is particularly suitable in this case because it is not only compatible with many lifting devices (a simple crane hook is enough), but also impresses with its user- friendliness and versatility. Using spill and kick plates, the grab can be adapted for a variety of bulk materials and therefore is suitable for handling coal, too.Thus, within a very short time, any crane can be used for bulk goods handling without additional equipment. An external power supply is not required. Maintenance is kept to a minimum thanks to the use of high- quality materials such as HARDOX and WELDOX in combination with an optimized design. This keeps the life-cycle costs as low as possible. A modular design enables the use of standard parts in different grab models, which greatly simplifies the storage and results in faster response times in the production of new machines and after-sales management. Thanks to the intelligent design, PSLT is also able to match up high grab capacities with low dead weight. Apart from the quality of PEINER grabs, PSLT is notable for its global service and dealer network that offers the customer a round-the-clock customer service. In addition to the assembly and start-up provided by its technicians, the company also offers training for the operating personnel. Thus the customers of PSLT get everything from one source. A very important factor in the entrepreneurial thinking are the issues of environmental protection and sustainability. Environmental protection does not begin only when the grab is finished. Both at the work preparation stage and in the production process, care is taken to reduce the impact on the environment. In addition, PSLT strives to keep the environmental impact associated with the use of grabs as small as possible. Especially when it comes to coal handling, an environmentally friendly solution is very important. A number of features make it possible to minimize the loss of bulk materials and dust. In addition to dust covers, these include special sealing systems on the side and bottom lips. The use of steel sealing strips, rubber-sealed lips, overlapping bottom and side lips or special side toothing prevents bulk materials from trickling down. In contrast to the competitors, PSLT’s four-rope dual scoop grabs are also designed with just one, rather than two scoop pivot points. This results in such movement of scoops that ensures a synchronous closing and excludes any offset between scoops.